-10°C opening ceremony concert, Ottawa -- music created by ice, water and steam. In this photo, deep bass rumbling is heard from soprano C. Mundy's careful movement of her fingers on water jets (fingers barely visible in photo). Ryan Janzen's compositions have been performed internationally in New York, Las Vegas, San Francisco, Copenhagen and Shanghai. Featured on CBC, Danish radio, and at the World Expo, Ryan Janzen's compositions have been sought after for art music, film, and esoteric concerts. As experience-designer/music director of 24 live concerts and producer of 3 albums, he has collaborated extensively with musicians, orchestras, and interdisciplinary researchers. Janzen's work embodies a fusion between art and science that comes naturally: Janzen's scientific research has led to advances in acoustics, aerospace engineering, and electric vehicle propulsion, and was awarded a federal grant from the Natural Sciences and Engineering Research Council. His music research is published in eight international music publications. After founding a technology consulting company in elementary school, Janzen worked on the award-winning film Commedia Fantasia (winner of the 2002 Houston International Film Festival Gold Medal Award in performing arts), and has since produced an array of art music, film music, orchestral and choral compositions, performance art, and high-tech performances that push the limits of art and science. 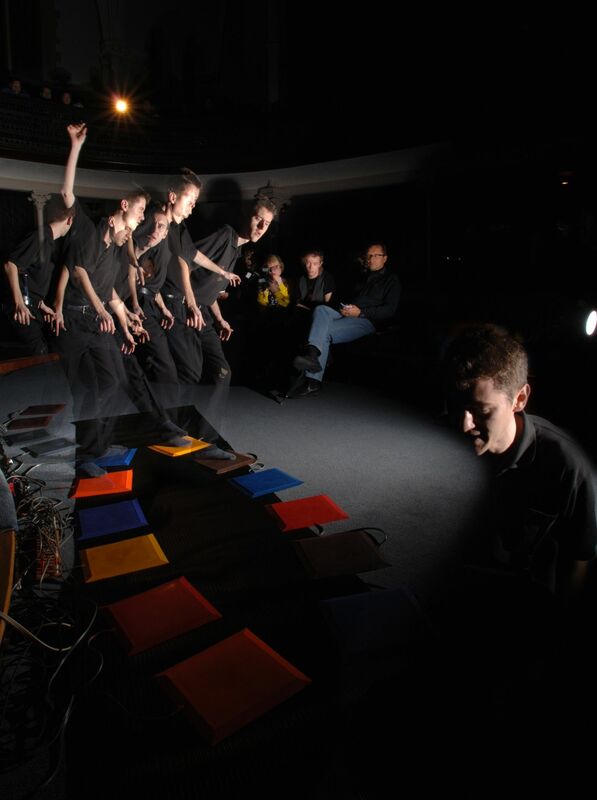 Janzen in 2006 was the world's first composer to create music for hydraulophone, an exotic instrument which is played by touching jets of water. Janzen developed a new expressive performance style and (along with inventor Steve Mann) a new musical notation which gives the performer access to a never-before-seen ability: polyphonic embouchure, brought into existence by hydraulophones. His film scores include "Ritual", a hybrid film+concert performance in which audience and performers are left in pitch dark. Janzen's compositions have been commissioned recently for a grand-opening of the Canadian National Institute for the Blind in Alberta, and for the Marshall Fels Elliott short film "After Hours". His compositions have also been performed at the Music Gallery in Toronto, NIME in New York City, and the Vandkulturhuset in Denmark. Janzen's multimedia work "Stray" was featured in a Florence, Italy presentation. This piece of music was written in the C programming language, for pipe organ and andantephone (a musical instrument designed with Steve Mann which transforms seismic waves from footsteps). Fusion between music and science is also Janzen's specialty as an invited lecturer internationally at courses and conventions alike. He spoke at the Metropolitan Museum of Art, New York, for the American Musical Instrument Society, discussing his recent work. He is featured in 22 newspaper, magazine and TV news programs on art, science and technology. The andantephone is a multimedia instrument whereby a performer advances through a piece of music through physical motion. 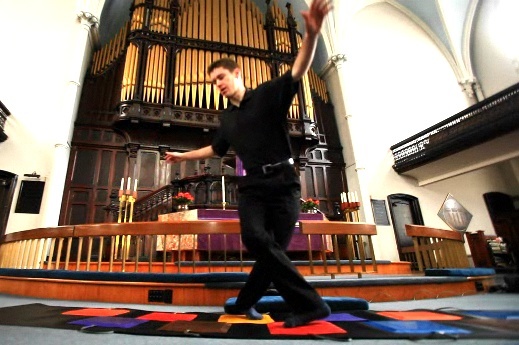 In this work, vibrations from footsteps, after being mapped to the notes and chords of the composition, were also encoded into serial FLUIDI data, to fluidly control the Casavant Freres pipe organ of St. Andrew's Lutheran Church, Toronto. The geophonic footstep vibrations were translated into crescendos and diminuendos moving between different ranks of pipes. This new work for andantephone follows the path of a wandering traveler through an unknown landscape. In this artificial world, space is brutally linked with time, and time with space. The explorer passes tumultuously through emotional stages of development, as if his life story is being fast-forwarded unwittingly by his movement. The composition process took place over two stages: The first was to create the artifical world (music programmed in C/C++). The second, an act of rhythmic interpretation, takes place on a higher artistic level and is visible to the audience. Taking the piece from early design into the final act of physical performance gave the feeling of rising above the clouds of technical and musical programming, into a wide open space where the creator/performer could roam free in a visceral, dramatic experience of the music. The Hydraulophone is the world's first instrument to make sound directly from water. Played by touching small jets of water, the hydraulophone produces a rich, unique, soulful sound. 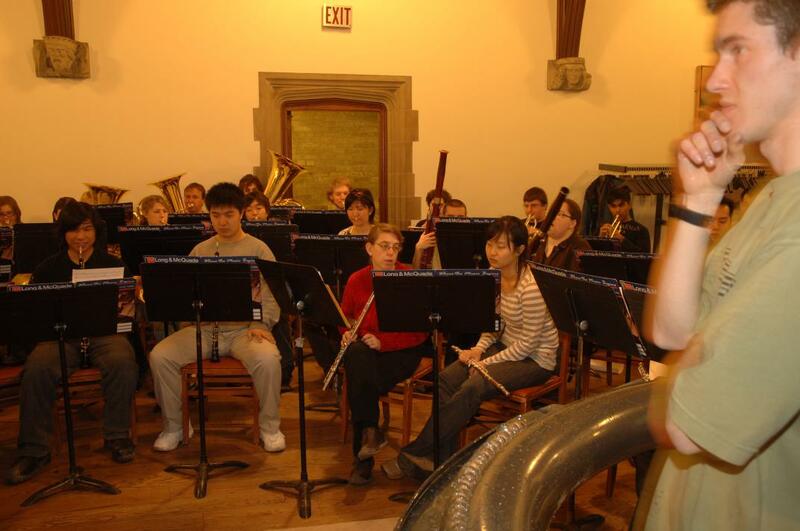 Janzen has featured it in concerts in New York, Copenhagen, Toronto, and Montreal. Two renowned inventors and designers, Steve Mann and Chris Aimone, have taken Mann's initial invention and turned it into a commercializable product, sold by a startup company, FUNtain.ca. Mann and Aimone have worked with Janzen on the science behind pressurized water and acoustics. This project has blossomed into new research in underwater turbulence, ranging from oceanography, to sonar, to whale communication, to experimental nonlinear physics. 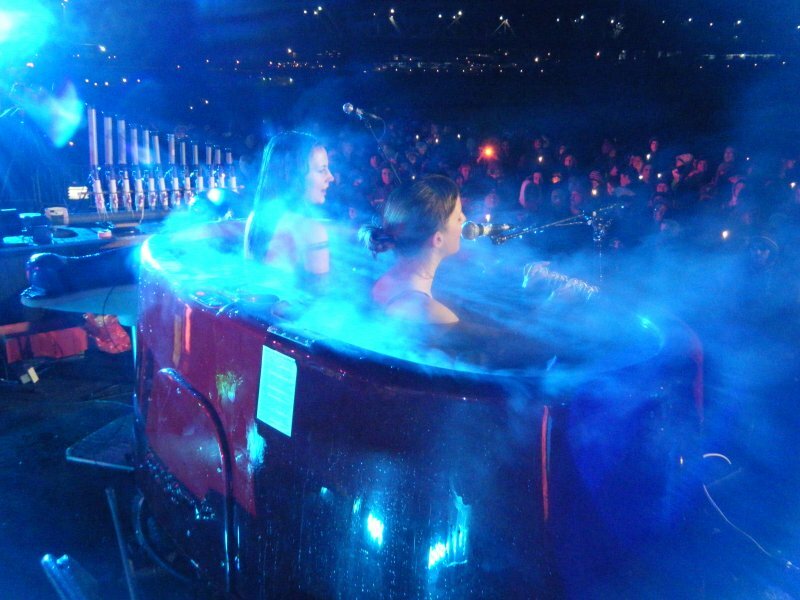 In 2007, Janzen premiered the world's first orchestral composition for hydraulophone. Suite for Hydraulophone has had a lasting effect to this day on the way hydraulophones are constructed, to maximize playability and expressivity. Janzen's other pieces include Changing Spirit of an Oxbow Lake, Evershadow, and Sketch for two pencils. Changing Spirit of an Oxbow Lake, performed on hydraulophone and violin (Colin Meier of Quartetto Gelato) [ orig video ] This piece was composed by RJ, and originally written for Yi-Ting Chen, violin. Hydraulophone, played with a polyphonic-embouchure finger-technique. Une Jeune Pucelle (Huron Carol) performed by Charlotte Mundy and Ryan Janzen. Janzen demonstrates this technique on a 45-jet hydraulophone (built by Mann/Aimone/Janzen); Mundy on vocals plus bass 12-jet balnaphone built into a SpaBerry hot tub. Suite for Hydraulophone is programmatic, and evokes a cycle of inner longing for a hidden river beyond reach, while at the same time alluding to water cycles in natural ecosystems. The piece was written particularly for performance on the Ontario Science Centre hydraulophone after its completion. RJ had spent time on location there while collaborating with Steve Mann and Chris Aimone on the engineering project, and later while rehearsing on the finished hydraulophone, spending evenings in solitude. Nearby, rivers and forests beckoned just beyond the edge of the Don River Valley watershed. This performance seeks to unite the ancient with the futuristic. Primal water flow is heard from hydraulophones, along with traditional instruments of the present, and, for two new pieces, electroacoustic ambient sound, melding sonics of the known and of the unknown. Four new compositions of Janzen were featured: Tempestate fluvium puer, Hanadagá:yas, Changing Spirit of an Oxbow Lake, and In the land where secrets bloom. A specially-chosen singing toilet makes tones when water is carefully driven through a valve. This recording uses one instrument from each state of matter: Solid (violin), Liquid (toilet), Gas (clarinet), Plasma (plasmaphone), and Informatic (brain-machine-interface). Performance with instruments spanning all five states of matter: Earth, Water, Air, Fire, and Quintessence. This is part of a larger body of work, collaborating with Steve Mann, Ryan Janzen, James Meier, Chris Aimone. Janzen is also seen playing clarinet. Sanctorum INCLUDING: "WHO ELSE GAINS TROUBLE AT HER DOORSTEP?" 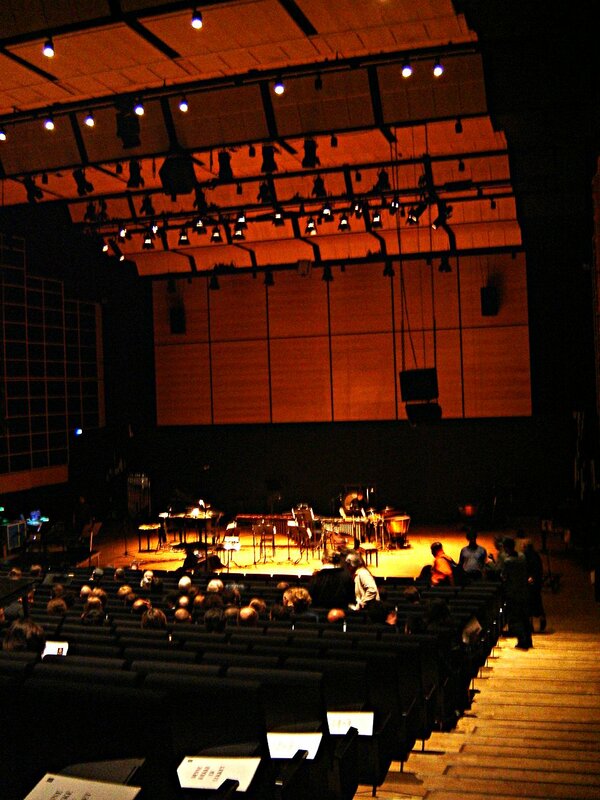 The participants are seated in a music performance hall. Musicians are waiting, with sheet music, ready to play. The lights fade to black, enveloping all participants in darkness. "Ritual" is a performance that consists of a film screened in the dark, where the contents of the film gradually spill out into the audience, with unseen musicians, actors, and confederates placed within the audience. The musical composition of "Ritual" ushers the listener through a dark, disquieting journey into the unknown. 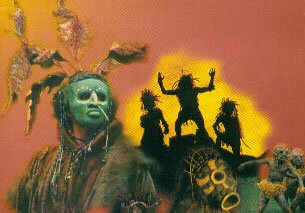 The passionate, soulful lives of a sect of clanspeople are seen in a joyous light as well as in a sinister light. The music bears influences from African roots, jazz, and medieval plainchant. It is a hybrid performance in the sense that it meanders between being a movie and being a live performance; the music coexists with drama onstage and events in the audience; an ensemble of live musicians play along with electronics; film rolls while stage lights swell and ebb through the darkness. Much of the music and concept originated in a dream. After all the composing and planning, the final experience for the listener still has a dreamlike quality. It is also somewhat emotionally intense, based on themes of kidnapping, psychological warfare, and the mystery of an isolated civilization. The piece resolves through courage experienced through the eyes of a young girl who enters this mysterious world against her will. 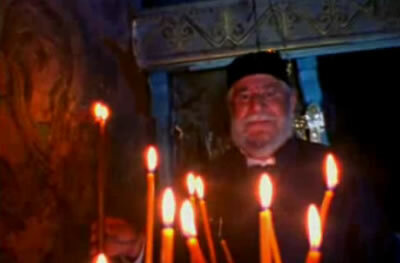 Film component of multimedia performance "Ritual", which is described above. 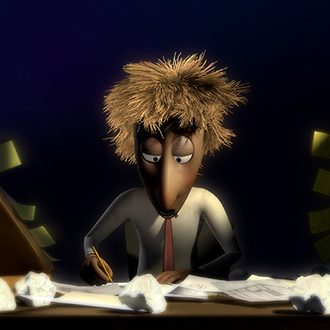 Janzen contributed to the award-winning film Commedia Fantasia (Winner of the 2002 Houston International Film Festival Gold Medal Award in performing arts). With visual artist Ed Janzen. Who else gains trouble at her doorstep? to solve the hopes of a world so foreign? by the ones who are so certain? Who else was freed, then taken by surprise? 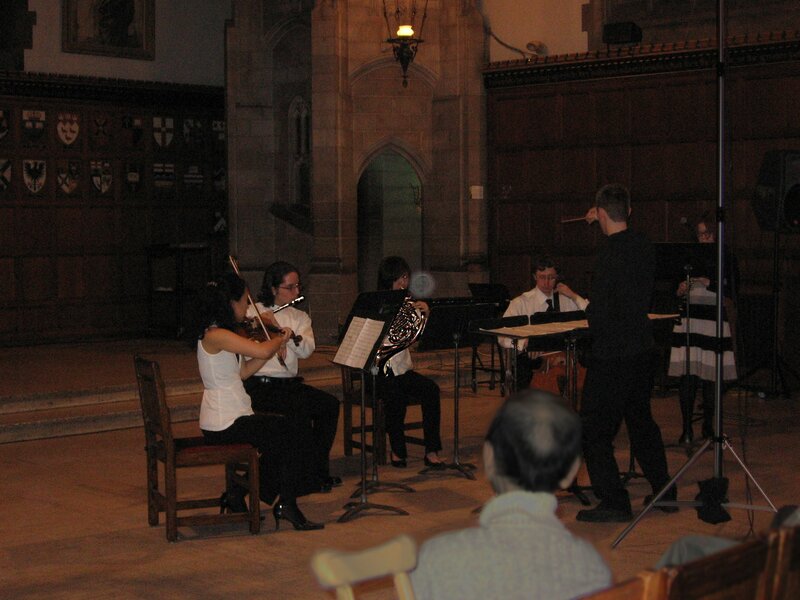 Performed at The Music Gallery, Toronto, April 22, 2008, 8 p.m. The hydraulophone will be also demonstrated by its inventor, Steve Mann.